Want to Win a $15 Amazon.com Gift Card? Those of you who subscribe to my e-newsletter were introduced to this contest in the August issue, but I wanted to open it up to everyone else, too. From now through Monday, November 5, 2012, I am asking people to submit pieces of their own writing. These can include articles, poems, short stories, and creative nonfiction–nothing exceeding 5,000 words, please. The January issue of my e-newsletter will be the “Reader Issue,” and I, along with other judges, will select five of the submitted pieces to publish in the e-newsletter. The five winners will each receive a $15.00 Amazon.com gift card. To enter, email your submission to me at angela@angelabaconbooks.com. In the subject of your email, put “Reader Issue.” In the body of the email, list your name, address, email address, phone number, and the title and category of your work (article, poem, short story, or creative nonfiction) and then provide the work as an attachment. No more than two submissions per person, please. Writing’s not your thing? There are still a few more days to submit your name for the drawing for Illegally Innocent, and there are a couple more weeks to submit your name for the drawing for Killer Colas on www.angelabaconbooks.com. Today is the beginning of a new contest! Killer Colas is an excellent, informative book about the dangers of the ingredients included in pop, energy drinks, Gatorade, and more. It provides insight into why (if you regularly drink liquids other than water) you might be experiencing some of the health problems you are currently facing and how those seemingly small issues can add up to bigger, more serious issues over time. Even some supposedly “healthy” drinks, like meal supplement drinks, are a bad choice when you pick apart the main ingredients listed on their labels. Consuming pop and energy drinks can contribute to Tourette syndrome, hypertension, reproductive problems, kidney stones, and osteoporosis, among MANY other health complications. This book includes several testimonies of people who were literally addicted to soft drinks and had to wean themselves off. Appleton and Jacobs provide several ways to help you become free of unhealthy beverages (or at least dramatically decrease your intake). Do you know what ingredients like sodium benzoate, bisphenol A, and caramel coloring are REALLY doing to your body? It’s time to find out. You can sign up for the drawing for this contest on my website, www.angelabaconbooks.com! I will notify the winner by email on September 10, 2012. THANK YOU TO ALL WHO PRE-ORDERED ILLEGALLY INNOCENT! I greatly appreciate your support! The ordering option on my website will now be shut down for a few weeks until the printer ships my initial order of books to me, and then I will re-open the ordering feature. If you pre-ordered, you should receive your order by October 15, 2012 (I will ship your book(s) to you as soon as I get them in the mail). If you haven’t signed up for the Illegally Innocent drawing yet, make sure you do soon! There’s only about a week and a half left until those winners’ names will be drawn. We drove to Michigan’s Adventure (a combo water park/amusement park similar to Cedar Point for anyone who has never heard of it) on Sunday afternoon after church. We spent the afternoon in the water park, and Mike acted strangely quiet all day. At dinner, he was texting someone the whole time, which is extremely out of character for him. Also, although he said he was really hungry, he only ate half of the food on his plate. I was getting a little suspicious but did not think something was going on until we were standing in line for the ferris wheel and when I tried to look at what he was texting, he pulled his phone away from me. Then, when we got on the ferris wheel, he held back and spoke to one of the ride’s attendants briefly. 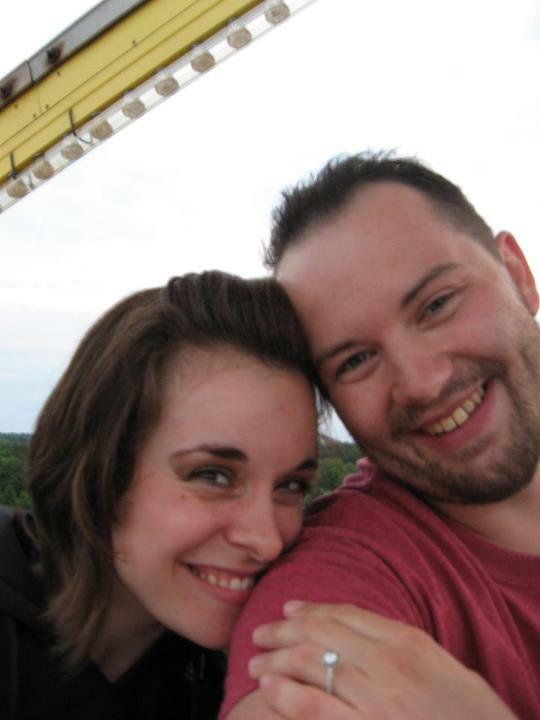 As we neared the top of the ride, the ferris wheel stopped and Mike told me to look over to my right. I didn’t see anything except for other rides and the parking lot, and I told him that. He then told me to look down more, and there on the grass was a banner that read “FAVORITES FOREVER?” (I feel like I need to explain this because some of the people I have told this story to verbally were confused–from time to time Mike and I say to each other, “You’re my favorite forever.”) He then unbuckled his seatbelt and got down on one knee and asked me to marry him, and, of course, I said yes!!! Mike likes surprises and we had not gone ring shopping together. I would have loved any ring he gave me, but I am especially excited that it has some black diamonds in it, as I wanted black diamonds in it but had never told him so! Thank you soooo much to everyone who helped make the day so special! I greatly appreciate all you did for us! Water is a topic I’ve been spending a lot of time reading about lately, so I wanted to share a little bit of what I’ve been learning. There will be more information about water in an upcoming e-newsletter. Something unrelated to the subject of water: Last Monday night we launched the pre-order option for Illegally Innocent! I’m offering a special discount of $10.00 per book plus shipping and handling (normal price will be $13.95 plus shipping and handling). Visit www.angelabaconbooks.com if you’re interested in pre-ordering.